Speak with a Windows & More representative here in the Lake Ozark area for ideas on how to add this color to your home. Selecting the Color of the Year takes approximately nine months. The staff at PANTONE explores a variety of industries to collect what they refer to as “proof points.” They review the latest from the auto industry, designer runways, and interior decorating showcases. Once they identify the trends, they narrow down the choices. Reminiscent of the first day of spring, Greenery is “a fresh and zesty yellow-green shade that evokes the first days of spring when nature’s greens revive, restore and renew.” According to Leatrice Eiseman, the executive director of the PANTONE Color Institute, this snow pea color “is the color of hopefulness and of our connection to nature.” From the new leaf green Mercedes-AMG GT Roadster to the flourishing foliage colors used by Gucci and Prada, this color will be everywhere this year. If you want to have Greenery in your home, you can add it in little doses in accents or décor like throw pillows. You may also consider new custom drapery or valances. 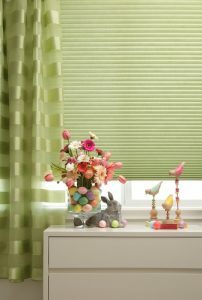 Or choose all new Hunter Douglas blinds and shades, which are available in numerous nature-inspired “greenery” options. Choices include Silhouette® Window Shading with Matisse® Quartette® fabric in Painter’s Passion, Duette® Architella® Honeycomb Shade with fabric in Oregano, Vignette® Modern Roman Shades with Heather fabric in Clover Field, Design Studio™ Roman Shades with Bohemian fabric in Pesto, Design Studio™ Roman Shades with Countryside fabric in Parsley, and more. Windows & More proudly serves Lake Ozark, Osage Beach & Camden, Miller & Morgan counties, with a showroom in Osage Beach. Contact us for a window treatment consultation! Discover inspiring ideas for your windows with the free Hunter Douglas Art of Window Dressing idea book. Click here to learn more. Ready to Make Some Home Updates? Have You Heard About the Color of the Year? In 1996 Dave opened Windows and More and has been in business for 36 years. Windows and More opened its first location as a Hunter Douglas Dealer below Pistols Plus. The company is now located on Highway 42 and became a Gallery in September of 2004. Stop by our showroom to find out more about our products and services. Located at Hwy 42 Across from School of the Osage. Windows and More services Lake Ozark, Osage Beach, Camden, Miller and Morgan Counties, Windows & More - Your Source for Hunter Douglas Custom Window Fashions, Blinds, Roman, Honeycomb Shades, Wood Interior Plantation Shutters, Draperies, Awnings and Much More.